This week, our class was given four spiny leaf insects to look after for the year. My teacher said that we should find out some facts about them, so this post is my homework as well. 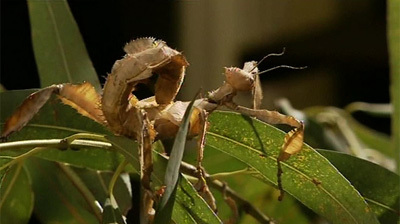 Also known as Macleay’s spectre stick insect, these large stick insects can grow up to 20 cm long. The females are much bigger and bulkier than the males which only grow about 11 cm long. They both have wings, but only the males can fly because the females are too big. Although they look scary, these guys are actually quite harmless. They rely more on camouflage than scare tactics, and will rock on their branch like a leaf in the wind when first discovered. When threatened, they don’t bite or sting, but stand up in a threatening pose that looks like a scorpion. They can also release an offensive odour to scare away predators. Spiny leaf insects have very unusual breeding habits. If there are no males around to fertilise the eggs, the females are still able to lay eggs in a similar manner to Komodo dragons, and the babies (called nymphs) all turn out to be females. When laying their eggs, the female flicks them up in the air with their tail, spreading them around the forest floor. The eggs are specially designed to attract ants who take them to their nests where the eggs hatch and the little nymphs look like the ants themselves, which keeps them safe from predators until they get bigger. They only eat leaves, preferring eucalyptus leaves, although they can eat others if they have to. Spiny leaf insects are very common and are found in Queensland and New South Wales. Are there any other interesting facts that you would like to share about spiny leaf insects?